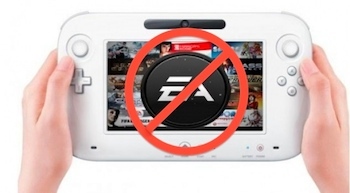 It sounds like the relationship between EA and Nintendo may be completely broken. It's no secret that third-party publishers have completely lost interest in making games for the Wii U. With near-stagnant growth in the year since its release and Nintendo's newly lowered sales projections, it's a safe bet the Wii U won't be winning developers back anytime soon, but there are always some fans out there who believe in Nintendo, who think it the Wii U will bounce back the way the 3DS did after its rocky start. According to a recent CVG report, it's time to give that dream up. AAA developers aren't going to come back to the Wii U. According to one anonymous EA staffer, the publisher doesn't believe it's possible for their games to be successful on the platform. "Nintendo was dead to us very quickly," said the source. "It became a kids IP platform and we don't really make games for kids. That was pretty true across the other labels too. Even the Mass Effect title on Wii U, which was a solid effort, could never do big business, and EA like Activision is only focused on games that can be big franchises". Another anonymous source from the publisher "working on perhaps the biggest franchise in games today," said Nintendo "just doesn't care about US developers" based on his experience working with the console-maker. The source doesn't say the publisher has severed ties with Nintendo, but it doesn't sound as if they're particularly interested pitching any more Wii U ideas. UPDATE: Electronic Arts Chief Operating Officer Peter Moore has very pointedly denied the "dead to us" claim on Twitter. "Don't trust 'anonymous sources'. Nintendo's a great partner," he wrote. "They never have been, and never will be, 'dead' to EA."